Learn how to knit this gorgeous beginner Montgomery Scarf with free knitting patterns. Keep warm and trendy with a homemade scarf. Cast on 25 sts. If you want to change the width of the scarf, increase or decrease the number of stitches by 2’s. Row 5: *K2tog, yo; rep from * until 1 st remains on left needle, k1. Rows 10, 12, 14: Purl. Repeat these 14 rows, ending with row 9, until scarf is the desired length. (Approximately 60 - 80 inches). I started knitting this tonight with Merino wool, and it looks fabulous. It bunches up a little, doesn't stay flat. Does this need to be blocked, or am I doing something wrong? I am new to knitting and confused. Row five says to repeat until down to 1 st, Then Rows 6 through 9 to knit... knit what? 1 stitch? It means knit the whole row. I want the pattern for the gloves also. 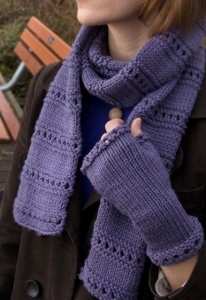 I would love to knit the matching fingerless gloves. Is there a pattern for these? I would also like to know where I can find pattern for mittens to match the scarf? You would think that showing the matching scarf and mittens, they would show pattern for both. where can i find the mittens to match this beautiful scarf ? I really like the scarf pattern. Next time I will try knitting Rows 1-14 three times then fill the rest with stockenette and finish of with rows 1-14 twice and row 1-9 once.